"The Floor Store With a Heart"
Fort Bragg's The Floor Store is truly a one of a kind "mom and pop" business with a big heart for appropriate community causes and events. Inside this attractive building you will find floor coverings, area rugs, lamps, pillows, and other delightful home furnishings. If you're looking to spruce up the home or apartment, or get a gift for someone else, The Floor Store should be at the top of your list. 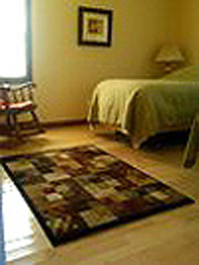 The Floor Store is conveniently located across from the Post Office in downtown Fort Bragg. Below you will find a long list of amenities, products and services the owners and staff of The Floor Store provide. Don't forget........ We do custom orders! This is an Area Rug that was a custom order, from The Floor Store!!! The chair and the Area Rug are a perfect fit!!! We can order Area Rugs, up to inch, of any size you need. I just love this combo, that our customer picked out---- HOW FUN!!! Available at THE FLOOR STORE- Creative Accents Area Rugs- Custom and handmade. 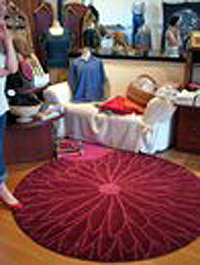 Creative Accents manufactures fine handmade area rugs in the United States using both high quality wool and nylon yarn. This allows you to pick a design from a folder, with many shapes and sizes and then--- pick your yarn of choice and all of your colors!!! We have a BEFORE AND AFTER post!!! One of our specialties is custom installation. As you will be able to tell from this staircase, you can have your flooring products look good and last longer--- with quality work. The pictures of the grey/brown carpet, show that time was not taken, on that job. The pictures of the blue/green carpet---- show how nice carpet on a staircase SHOULD look!!! The Floor Store is excited to have Organic- Biodegradable- Eco-Friendly, home cleaning products!!! We will have a home cleaning kit, glass cleaner, dish soap, all purpose cleaner, countertop spray, laundry detergent, delicate fabric wash, hand wash, body lotion and more! This line has a mild blend of pink grapefruit, zesty lemon accented by Kaffir lime, Mediterranean bergamot and vanilla! Yummy! WE OFFER RUG SALE DEALS FROM TIME TO TIME! Ready for a weekend deal??? Occasionally we have to have a little FACEBOOK fun ---- okay, so HERE IS AN EXAMPLE - This beautiful area rug arrived - It was a 5.5 x 7.9 and 100% nylon - we put it on sale on our FACEBOOK Page---- Regular price $500.00 –Floor Store Sale- $299.99 BUT mention that you saw it on FACEBOOK and it could be yours for only $199.00!!!!!!! You could save $301.00 by mentioning FACEBOOK!!! Call 707.964.8889 and make this rug yours!!!! OUR SPECIAL SALES ALWAYS HAVE TERMS: This area rug had a modern look, with colors of gold, green, and brown tones. It is made with Type 6 NYLON – The only fiber capable of being recycled into new carpet and area rug fiber. Shaws Evergreen line!! Go GREEN!!! This sale only applies to this one rug- Sale does not apply to any other area rugs. Bye-Bye Old Vinyl- Carpet and Peel-n-Stick ----------HELLO--- NEW LAMINATE!!! This is a complete transformation. Look at the before and after pictures (on the Facebook Page) and notice how one product can change the space. I LOVE this LAMINATE it looks so good! You don’t need a big space, for the change to be big, by just eliminating the combination of products and putting one product in, the space looks bigger and defined. These girls were so much fun to have in the store and to get to know, I am glad they have a new space!!! 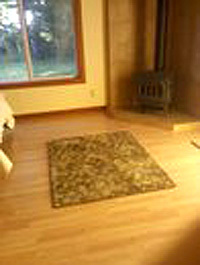 There are so many different styles and grades of laminate flooring. It is versatile, durable, easy to care for and affordable. For families with kids, pets and a lot of coming and going, laminate flooring can be an ideal choice. Sometimes, people are afraid to purchase a laminate flooring product because they think it might not look as good-- as wood--- however there are so many styles, colors and variety to choose from. Laminate can be beautiful and last a long time, while looking like the day it was installed, the trick is----not going low end. Next time you are in the market for a hard surface flooring product, consider a quality laminate floor and you just might be surprised! The Floor Store has access to order products even if you don’t see them in our store, just ask!!! From old to new again!!!! Before-During & After Pictures!!! We had a customer that was moving and wanted to clean her old vinyl floor. Armstrong has a great product, a Floor Stripper that removes tough ground-in dirt and dissolves wax and polish build-up without damaging your floor. She had tried many different cleaning products and nothing worked until----- she came to us and found Amrstrong's Floor Stripper. If you have a vinyl floor that needs a good cleaning, you will love this product. Recyca-bulls by Echo- - Unique, handmade collars and leashes made from repurposed leather goods and 15% benefits Daisy Davis Pit Bull Rescue!!! Thanks ECHO!!! These collars can be seen on the north wall of THE FLOOR STORE- 144 N. Franklin St- Fort Bragg- CA or See Daisy Davis Pit Bull Rescue and Echo the Deaf Pittie Mix on our FACEBOOK page!!!! So there you have it - a complete Floor Store "Mom and Pop" Business with a BIG HEART located in a historic All American town - What more would you want in a Floor Store?